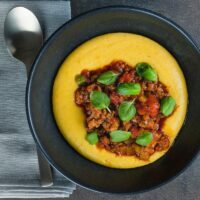 A real hearty and comforting dish, a perfect Italian sausage ragu over a rich and indulgent cheesy polenta, pass me the red wine! 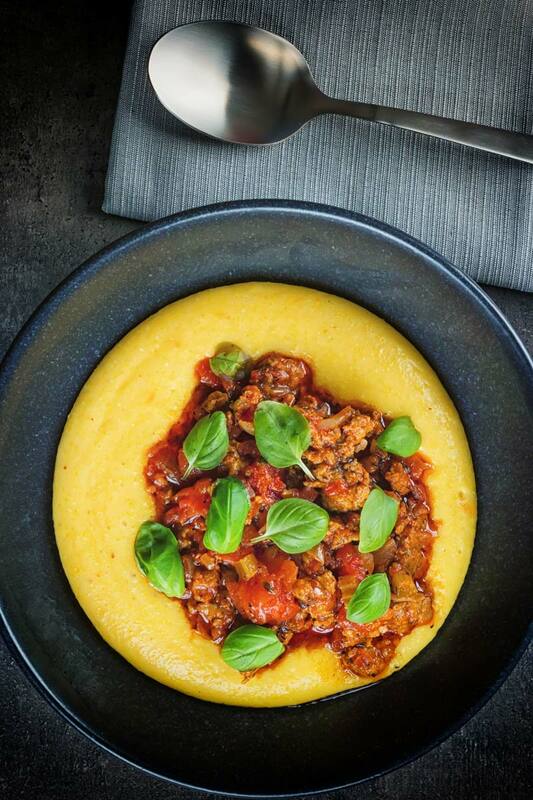 Italian Sausage Ragu With Cheesy Polenta. I’ve been intrigued by sausage ragu recipes on t’interweb for a while, and I figured that it would be a good way to expand my sausage repertoire. Especially as I have been making my own sausages for years. As a result, the process was not too intimidating and they were yummy. 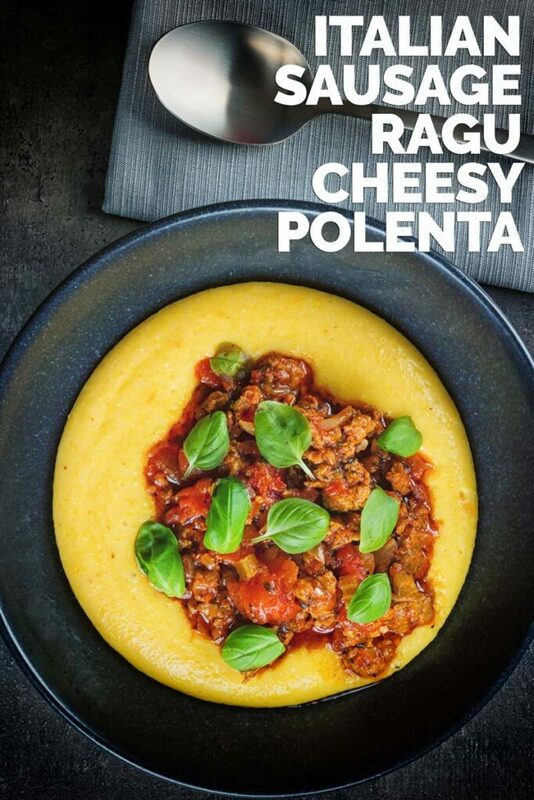 I typically see sausage ragu recipes served with pasta, but I love a cheesy polenta. I use smoked Gouda in this recipe it marries really well with the flavours, but you can use any cheese you like. Obviously, if you can find a good smoked cheese I would urge you to give it a try. This ragu recipe unusually for me serves four rather than two. It does, however, save wonderfully for a few days in the refrigerator or for a month in freezer. The Secret to Big Flavour. This sausage ragu recipe already starts out with boatloads of flavour from the sausages. But that is not all we have here, we are braising that sausage in a tomato sauce. That tomato sauce must bring flavour to the party too or there is no point it being there! 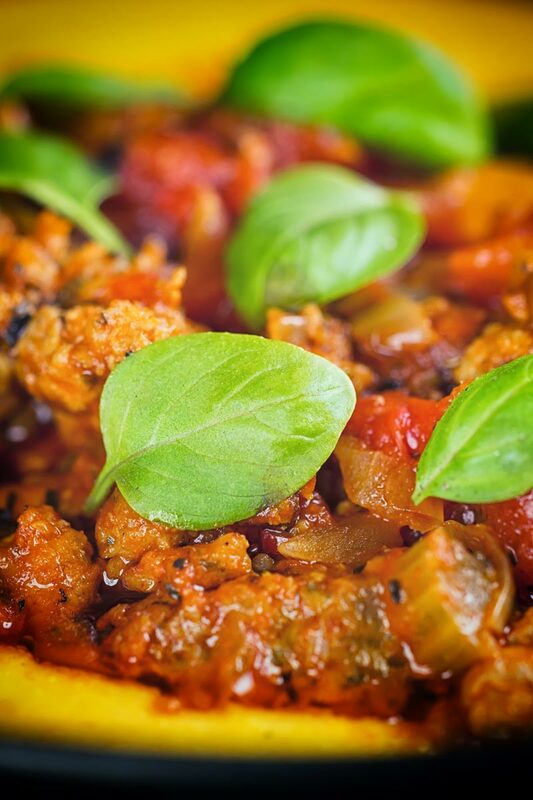 Tomato sauces can err on the side of bland, the secret is to reduce off water from the sauce. This leaves all of the flavour behind and creates a thick unctuous sauce for the ragu. A reduction is a technique I use in sauces as varied as my beef vindaloo to the gravy for my whole roast duck. It is simple and it works and requires nothing but patience! Do not turn up the heat too high though or you will burn your dinner! Given that most of you are American I’m guessing both sweet and spicy Italian sausage is not an unusual ingredient to you. For those of you less familiar, Italian sausage is more of an American Italian thing. It is typically made with pork, red wine vinegar, salt pepper, paprika, garlic powder, onion powder sugar, oregano and basil (and chili flakes if spicy). It is also really simple to make at home. Mix together the ingredients, then fry off a patty to test the flavours and seasoning and you are sorted. If you are feeling adventurous stuff in to casings and you have a real treat. When I say adventurous I do not mean difficult. Check out the video on this Cumberland sausage recipe. It shows how simple making sausages really is. If you have any other ‘Italian sausage’ ideas or recipes drop me a comment because I’d love to read your recommendations. Heat the olive oil in a large frying pan over a low to medium heat. Add the onion and celery and cook for 10 minutes until softened but not coloured. Mash the skinless sausage in a bowl and then turn up the heat to high and fry off for 10-15 minutes until nicely coloured. Add in the tomatoes, thyme, black pepper and bay leaf cover and cook for 30 minutes. Now we can start the polenta which should take 45 minutes. Bring your chicken stock to a boil then reduce to a simmer. Pour in the polenta slowly whilst continuously stirring and continue to stir until cooked. After 30 minutes remove the lid from the ragu and allow to finish for 15 minutes with the lid off to reduce. Stir in your cheese and butter until it is melted then serve. The sausages will likely contain enough salt for the ragu however have a taste and add more if required. Holy moly this looks amazing! I have a weekness for cheesy polenta, and this super flavorful ragu is the perfect companion!! This dish is total comfort food for me! I love the smoked cheese in the polenta. I am dying to try this! This is my idea of perfect comfort food, love it! Sounds sooo good if paired with a glass of good wine! I need to cook with polenta more often. Great recipe! This is so up my alley — I love, love this sort of dish. So perfect on top of a rich and creamy polenta, with my favorite cheese no less! Delicious! I absolutely LOVE your photographs! 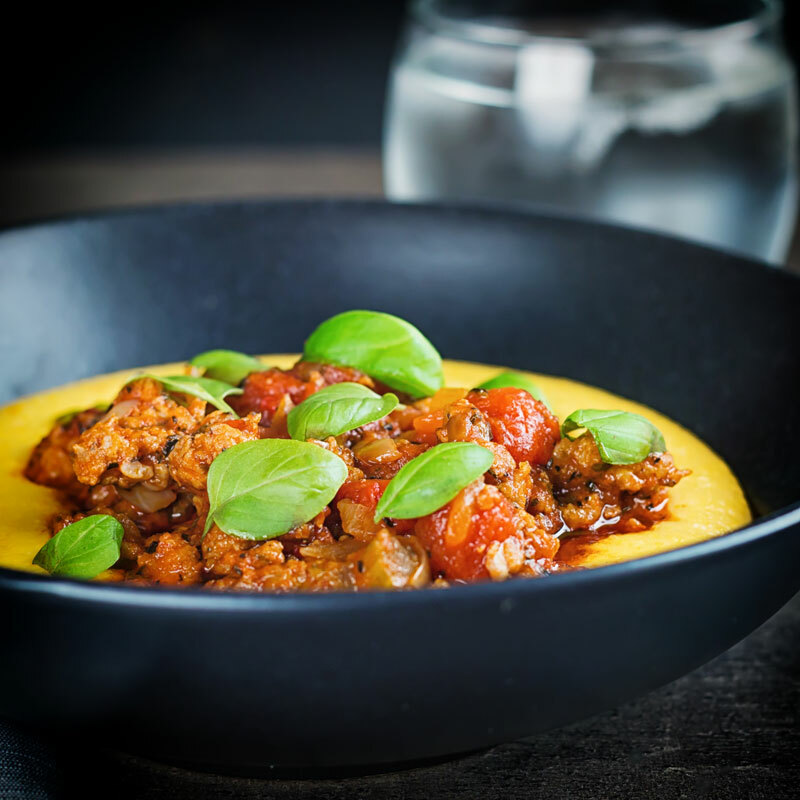 This polenta dish looks delicious and perfect for a romantic dinner. The ragu looks so comforting, and I just can’t wait to try this recipe.